The common way to log from a PHP application running on nginx + php-fpm in a Docker container is via the catch_workers_output php-fpm feature. Once enabled, the php-fpm master process will capture everything written by any worker to php://stdout and php://stderr, and will write it to the error_log. You can configure php-fpm error_log = /proc/self/fd/2 to write all captured logs to the master process stderr. 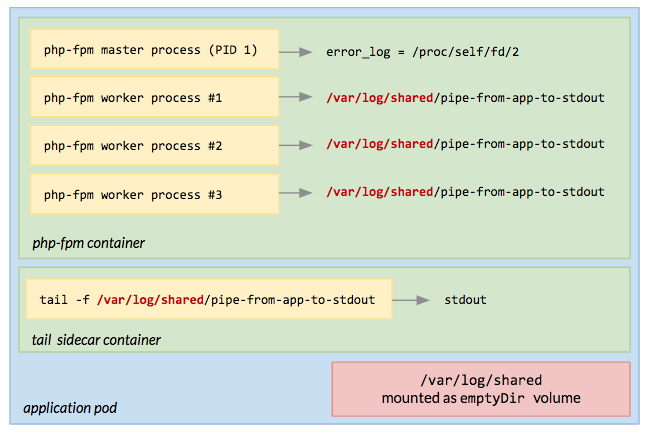 If the php-fpm master process runs as PID 1, its stderr will be captured by the Docker logging driver and exposed outside the container (ie. on Kubernetes we run logstash as daemonset to capture all containers output and collect it for later analysis or querying). You can find a full working example here. [24-Jan-2019 08:30:14] WARNING: [pool www] child 6 said into stdout: "App log message to stdout"
[24-Jan-2019 08:30:14] WARNING: [pool www] child 6 said into stderr: "App log message to stderr"
[24-Jan-2019 08:35:34] WARNING: [pool www] child 7 said into stdout: "[...] TRUNCATED"
[24-Jan-2019 08:35:34] WARNING: [pool www] child 7 said into stdout: "CONTINUE-PREVIOUS-MESSAGE"
Writing to a unix pipe blocks indefinitely if there’s no process that opened it for reading. This means that if - for any reason - tail is not running, writes from the PHP application will block until tail is running again (Kubernetes will restart the tail container in case it crashes or exits). The good news is that it’s not required the reading process completes the read operation from the pipe to unblock the writer, so the writer performances (PHP) are not affected by the reader performances (tail). Last but not the least, since we have multiple processes concurrently writing the pipe, a note about locking. Writing to a unix pipe without locking is safe (atomic) as far as each write is smaller than 4KB (see this discussion for more details). In case you support larger log messages at application level, you should use flock($fd, LOCK_EX) and flock($fd, LOCK_UN) to respectively lock and unlock a file descriptor. Popular logging frameworks like Monolog already support locking (ie. see useLocking option of StreamHandler). The unix pipe strategy - with tail running in a sidecar container - has been improved thanks to the great feedback by Michael Gasch.